Because after my researches I really got excited to explain you all the fantastic features it got. Not long ago I reviewed the Bonavita BV1800 and it is still one of my favorite coffee makers. But the new Bonavita BV1900TS has several great features and improvements to promote an even more exceptional coffee in your cup. And on top, it is over $100 cheaper than the Technivorm Moccamaster, one of the kings of the drip coffee makers. So stay with me and I will provide you with all the new features, design changes and where you can get the best price! 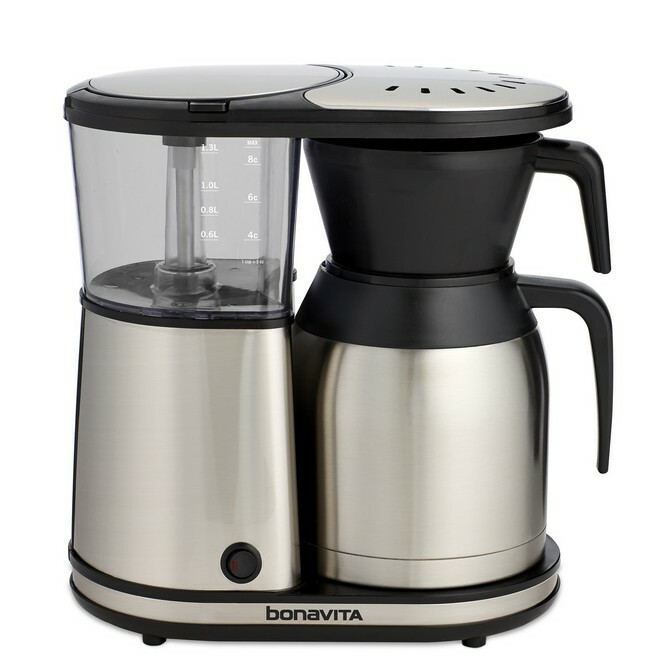 The Bonavita BV1900TS is one of the few drip coffee makers that made it on the certified home brewer list of the Specialty Coffee Association of America (SCAA). To receive this certification, the coffee maker must meet specific requirements determined by the SCAA. There are more requirements that are listed in the SCAA’s certified home brewer booklet. Bonavita has increased the power of the BV1900 to 1500 Watts. The manual even states that this is the highest wattage of any household coffee brewer available in North America. This change reduces the brewing process by almost one minute compared to the BV1800 with 1455 Watts. In terms of brewing time, your coffee is ready to drink in about 6 minutes for a full 8 cup carafe of coffee. Not only speed is a result of the high power. It also guarantees the water temperature to stay consistently between 198 and 205°F. As you probably can remember, this is an important condition to receive the SCAA certification. Bonavita has equipped the BV1900TS with a Pre-Infusion feature to let the coffee ‘bloom’ before the brewing begins. You may have heard the expression “blooming” before but if not I will explain it quickly. I will try to be brief about the chemical reactions of the bloom and why it is so important for a better flavor. When you pour hot water over freshly ground coffee, CO² or Carbon Dioxide is released. If more and more water is coming, as it is with most of the average coffee makers, the gasses cannot escape. And when your coffee is not able to “degas”, you may find your coffee to be excessively bitter or taste like acid. And the purpose of the Pre-Infusion feature is exactly that – to degas the grinds by pre-wetting them before the brewing cycle starts. The Bonavita BV1900TS is equipped with an extra wide 3-inch showerhead (2¾ inches of Bonavita BV1800). The wide showerhead and the flat bottom filter work perfectly together to evenly wet the coffee grinds not only in the middle but also along the edges. And this procedure results in a perfectly balanced coffee, neither over nor under extracted. As with the BV1800 coffee maker Bonavita also offers a two-year warranty for the BV1900 TS (link to the warranty information provided below). I really want to emphasize this extra year of protection, since not a lot of (or any?) other coffee maker manufacturers offer it. The footprint of the Bonavita BV1900TS Coffee Maker is even smaller than its predecessor, the BV1800. With 12 inches in height and depth and 7 inches in width, it does not need a lot of counter space. The frame material of the Bonavita Coffee Maker is stainless steel and all plastic parts are BPA-free. To maintain the temperature of the coffee for several hours, the stainless steel carafe is equipped with a double wall insulation. Only one button can be found, which not only turns the coffee maker on and off but also activates and deactivates the Pre-Infusion feature. The Bonavita BV1900TS does not need to create attention with its design to be respected. Quite the contrary: the inner values like pre-infusion, wider showerhead or flat bottom basket to just name a few, work so well with each other. Therefore, it is no surprise that coffee experts, including the SCAA only have honorable words for the Bonavita BV1900TS coffee maker. For about $180 it is by all means, not the cheapest coffee maker you can buy. But isn’t it worth paying a little extra for the simplicity to get a perfect cup of coffee every time of the day? Allow yourself a little self-indulgence and place an order now at Amazon to get the best price.